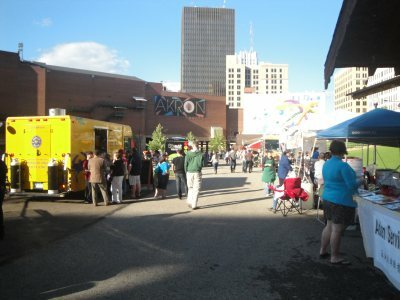 The first Global Village Festival of Akron was held at Lock 3 in Akron last weekend. I admit- I went because of the food. I'd heard that a few of the food trucks from Cleveland were going to be there, so I stopped by. I'm glad to say, there was plenty of food- Wafa's Lebanese Eatery, The Pierogo Lady, Zyedeco Bistro Truck, Streat Mobile Bistro Truck, The Nosh Box Truck, and booths selling food from different international clubs. The Nosh Box was offering tacos, burgers, and tater tots. I ordered two chicken tacos and the tater tots. 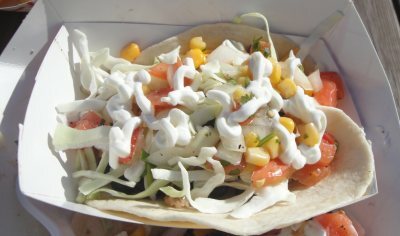 The pulled chicken in the tacos was moist, flavorful, and nicely seasoned. 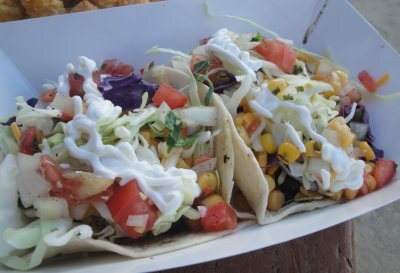 It was served on soft flour tortillas and topped with black beans, corn, green and red cabbage, tomatoes, cilantro, shredded cheese, and sour cream. 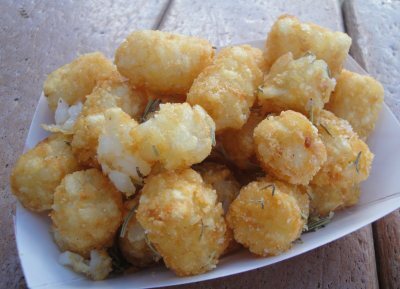 The tater tots were crispy and seasoned with rosemary and sea salt, and were awesome! When I went back up to the truck to get some more napkins, I saw a sign that said you could mix and match the tacos. I was bummed that I hadn’t noticed the sign before- I had really wanted to try the pork taco! I mentioned this to the couple that owns the truck (I feel bad that I didn’t get their names- I was too busy eating!). I wasn’t complaining- it was my fault that I hadn’t seen it. But, I was just lamenting that I had wanted to try the pork. The husband offered to give me a pork taco. I told him it was okay, but they insisted, and gave me one free of charge! The pork was terrific- I was really glad I got to try it! The owners were really friendly and said they often give food away to people, including the homeless that they come across in Cleveland. 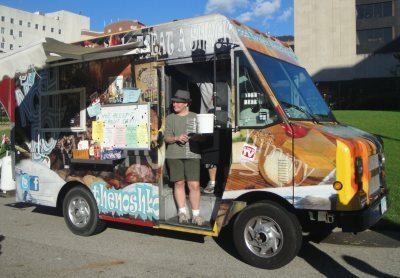 The owners told me that that they will be at most Walnut Wednesdays in Cleveland, and will be up at Cleveland Public Square over the next few weeks on Tuesday and Friday. Stop by, say hello, and check out some of their amazing food!ross in Cleveland.ry and sea salt, and were awesome!